Back to Fiscal 2017 Budget and Appropriations index page. 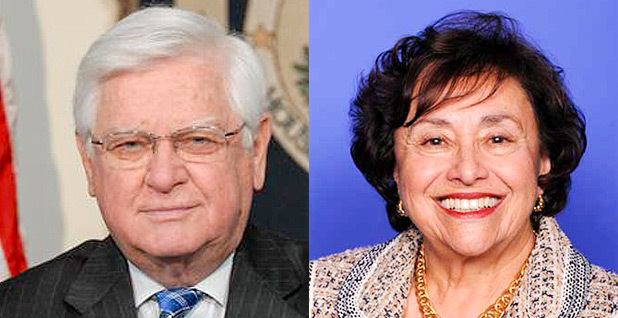 House Appropriations Chairman Hal Rogers (R-Ky.) compared the spending plan to "a critical" Band-Aid, while ranking member Nita Lowey (D-N.Y.) called it a "disgrace." Photos courtesy of @RepHalRogers via Twitter and The Democratic Caucus. House and Senate Republicans introduced stopgap spending legislation yesterday evening that will avoid a government shutdown at the end of this week by funding federal agencies through April 28. The bill, which needs to pass by Friday, is angering many Democrats for including a provision to deal with one of President-elect Donald Trump's Cabinet picks. Language dealing with miner benefits is also not what a bipartisan group of senators wanted. The legislation would largely put federal agencies on autopilot for the next four months until Republicans can finalize final fiscal 2017 spending. The GOP made the move to reset funding once Trump is in the White House. The Fiscal 2017 Budget & Appropriations continuing coverage is a one-stop resource for tracking the fiscal 2017 spending process for environmental and energy accounts. Click here to view E&E's continuing coverage. The 70-page spending measure does contain dozens of minor adjustments and authorizations for various federal programs that would face significant disruptions without tweaks. The bill would provide billions of dollars in new emergency funding: $170 million for addressing the lead water crisis in Flint, Mich.; $4.1 billion in response to several natural disasters, including Louisiana flooding; and $10.1 billion for the Defense and State departments' overseas operations. "This legislation is just a Band-Aid, but a critical one. It will give the next Congress the time to complete the annual appropriations process, and in the meantime, take care of immediate national funding needs," said House Appropriations Chairman Hal Rogers (R-Ky.). Rogers said the bill does not include controversial riders or make major changes in federal policy. Rep. Nita Lowey (D-N.Y.), the ranking member on Appropriations, called it a "disgrace" that Republicans would not wrap up spending work for several more months. But she said she was pleased the measure contains aid for natural disasters, improving water infrastructure, responding to threats abroad and supporting biomedical research. The legislation, known as a continuing resolution, is due at the House Rules Committee later today and is expected be approved by the full House tomorrow. The Senate would then clear it, and the White House has signaled President Obama will sign it into law. The bill sets total spending at $1.07 billion, matching the cap set by last year's budget deal. The CR is needed because Congress has only passed one of its 12 annual spending bills for fiscal 2017. Under the CR, $45 million would be set aside to maintain health care coverage for a subsection of United Mine Workers of America retirees whose benefits are set to expire Dec. 31. Coverage will now run out again April 30 with the CR. The money would be "fully offset," appropriators said. UMWA President Cecil Roberts called four months of health care benefits for 22,000 miners "a travesty" and a step toward "deeper economic disaster" in struggling coal regions. "America's miners put their lives on the line to provide the fuel that built our nation," he said in a statement. "Is their reward to become a perpetual political football, doomed to beg every four months for the benefits they earned and our nation promised them?" After a bitter fight in Congress, the CR does not include the full "Miners Protection Act" package, H.R. 3470, that would have provided long-term funding for both health care and UMWA pension funds covering more than 120,000 retirees (E&E Daily, Dec. 2). Despite bipartisan support, a disappointed Sen. Shelley Moore Capito (R-W.Va.) said bill proponents now only have "more work to do." "I will continue fighting until a long-term solution is reached," she said. The bill does not appear to include any other significant mining provisions, including a proposal to accelerate the spending of abandoned coal mine reclamation funds. For environmental and public health advocacy groups, the legislation represents good news by virtue of what is absent: dozens of policy riders approved by the House in July. Those measures sought to stymie new regulations on Arctic oil and gas development, stop U.S. EPA from proceeding with implementation of the Clean Power Plan and block the Obama administration from creating new national monuments under the 1906 Antiquities Act. None of those are present. A handful of Democratic priorities will also suffer, however. In July, Rep. Ben Ray Luján (D-N.M.), for example, had succeeded in adding $6 million for long-term monitoring on two rivers affected by last year's Gold King mine spill in Colorado. That funding is not included in the CR. Also gone is a rider by Rep. Jackie Speier (D-Calif.) to bar the National Park Service from restricting "off-leash" dog walking in Golden Gate National Recreation Area near San Francisco. The agency's plan had been by panned by many Bay Area dog owners. Nor does the CR include tax credit extensions for combined heat and power, small wind, geothermal heat pumps and other technologies left out of last year's spending deal. For months, various industries have lobbied Capitol Hill, saying the failure to extend credits by the end of the year could lead to widespread layoffs and a collapse in sales for many technologies (E&E Daily, Nov. 30). Yesterday, for example, the employees of Plug Power Inc., a hydrogen and fuel-cell company, sent an open letter to Trump, stating that "Congress is allowing solar to benefit from an investment tax credit, but our industry is left without a level playing field to compete." The CR also leaves out expanded tax credits for the carbon capture and sequestration industry, which says it needs the allowances to help develop more projects to remove CO2 emissions from power plants and industrial facilities. Many science and research programs that were counting on a budget increase are losers, too. At an event on Capitol Hill last month, several groups said that a CR prevents agencies, and science grant recipients, from doing long-term planning. "Congress is making it hard to do good science ... for no good reason," said Harry Stein, director of fiscal policy at Center for American Progress. Appropriators included language that would require the Department of Energy to draw down and sell up to $375 million worth of crude oil from the nation's Strategic Petroleum Reserve in fiscal 2017. Proceeds from the drawdown and sale would then be deposited into the Energy Security and Infrastructure Modernization Fund and be made available for the second life extension of the SPR. The spending bill falls short of the Obama administration's request for about $2 billion to make upgrades at the nation's aging oil reserves along the Gulf Coast. The SPR holds nearly 700 million barrels of crude in underground caverns along the coasts of Louisiana and Texas, and DOE officials have said the facilities are aging and growing ineffective as equipment degrades and a domestic oil market booms. DOE has called for $800 million in upgrades to address a growing backlog of maintenance and equipment failures, and an additional $1.2 billion to build marine terminals for shipping oil abroad and avoiding congestion seen throughout the region's pipeline network. DOE has said planned sales from the reserve will only make the situation worse. Separately, the spending bill would provide more than $767 million for the Uranium Enrichment Decontamination and Decommissioning Fund. That program is managed by DOE's Office of Environmental Management and supports the cleanup of some of the nation's most contaminated areas — in Tennessee, Kentucky and Ohio — used during the Cold War to supply enriched uranium for nuclear warheads and commercial nuclear reactors. Much of the bill's spending contains routine or bipartisan emergency spending that won't draw much opposition. The $170 million for Flint would come in the form of grants for infrastructure improvements, lead poisoning prevention and care, and a lead exposure registry. That's more than the $135 million the Senate Appropriations Committee planned to provide for Office of Lead Hazard Control and Healthy Homes grants for fiscal 2017 as part of an appropriations bill the panel passed in the spring (Greenwire, April 19). Perhaps the bill's most contentious point is one that would allow for the Senate to consider Trump's pick for secretary of Defense, retired Marine Gen. James Mattis. Currently, federal law prevents retired military officers from becoming secretaries of Defense within seven years of active duty. That law applies to Mattis, who retired in 2013 (E&E Daily, Dec. 2). Under the stopgap, the House would provide a waiver for Mattis' nomination and would establish a process for the Senate to quickly create a similar waiver. Even though the resolution does not mention Mattis by name, its scope and timeline is limited to only apply to someone with Mattis' qualifications. House Minority Leader Nancy Pelosi (D-Calif.) warned that approving the waiver would set a "terrible precedent" and could undermine civilian control of the military. "It is troubling that Republicans are working so hard to shield President-elect Trump's choice for Secretary of Defense from the scrutiny and debate of Congress and the American people," she said. Senate Democrats have raised similar concerns about the effort. However, it's not clear if Senate Democrats would try to filibuster the bill to have the waiver language removed. Democrats may be reluctant to pick a fight over Mattis, one of the nation's most decorated wartime commanders. Reporters Sean Reilly, Dylan Brown, Hannah Northey, Christa Marshall, Ariel Wittenberg, Corbin Hiar and Geof Koss contributed.